Recently, rebounder exercises have become an extremely popular way of keeping fit and healthy. Many gyms are now offering rebounder classes, as this form of exercise is great for cardiovascular health and gentle on joints and ligaments. However, many people choose to purchase their own rebounder for home use. With many different brands and models on the market, it can be hard to know which is the best choice. Urban Rebounder are a brand that have been gaining popularity recently, so are they the right brand for you? Read on for our Urban Rebounder trampoline review. What makes the Urban Rebounder stand out? How does Urban Rebounder compare to other brands? Where do I find the Urban Rebounder for sale? 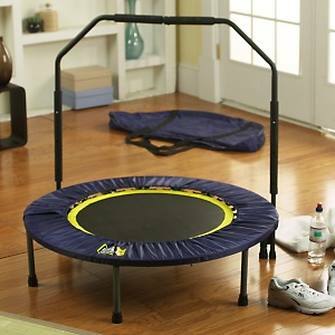 The Urban Rebounder mini-trampoline is designed specifically for fitness routines in the home. Currently retailing at around $130, it is similar to the types of rebounder you will find at a rebounder exercise class in a gym. Check latest prices on Amazon here. Here are the key features and benefits. Dimensions: Fully assembled, the trampoline is 10" high (without the bar) and 40" in diameter. This is the standard measurement for a fitness rebounder. Fully foldable: This is a handy feature for those who are short on space, or who want to be able to travel with their rebounder. When not in use, you can simply fold up your mini-trampoline and store it away. Designed for quick assembly: Urban rebounder say that their trampoline can be put together by one person in about 15 minutes. Rubber tipped legs: This is an advantage if, like most users, you want to use your trampoline indoors. The rubber tips protect your flooring from any scratches or damage. Also, rubber tips add to the safety of the rebounder, as they prevent it from shifting position during use. Stability bar: The model comes with a stability bar included, which allows you to hold on and prevent any trips or falls during use. This is particularly useful for seniors, or those who struggle with balance. If you don't want to use it, or you grow in confidence as you progress, it can be removed. Fitness DVD: Additionally, this rebounder comes with a complimentary DVD which features 6 rebounder workouts. These are led by fitness trainer Rebecca Kennedy. This is a nice perk, as it allows you to exercise on your rebounder effectively without forking out on expensive gym sessions. One of the standout points of this trampoline is the affordable price. It's one of the most budget-friendly models on the market, and it's unusual to find a rebounder at this price that also includes a stability bar. The fitness DVD is a good added extra, as it allows you the benefit of a guided workout from the comfort of your own home. Before you commit to buying an Urban Rebounder trampoline, it's important to know how it compares to other leading brands. With so many makes and models no the market, it is important to compare a few brands to make sure you are purchasing a rebounder that will meet your needs. With that in mind, we've made a handy comparison guide between Urban Rebounder and other popular brands. One of the key differences between Urban Rebounder and Jumpsport mini-trampolines is the price, with a Jumpsport rebounder coming in at around double the price. Therefore, if you're on a tight budget, Urban Rebounder may be a good option for you. On the other hand, Jumpsport have much higher overall customer satisfaction, so it may be worth paying more for better quality. 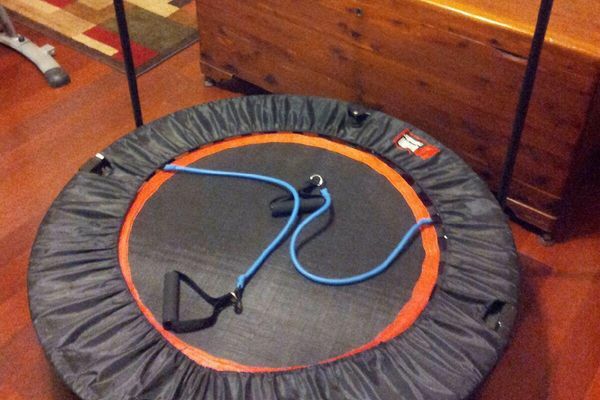 Another key difference is that Urban Rebounder uses springs whereas Jumpsport uses bungees. Which is best for you comes down to personal preference. The springs of the Urban Rebounder will give a firmer bounce, while bungees are gentler on joints. Bear in mind, though, that bungees will give a silent bouncing experience, while springs can develop annoying squeaks and creaks. Cellerciser and Urban Rebounder trampolines are a little more similar, as they both utilise springs to achieve bounce. Both are also foldable, making them portable and easy to store. On the other hand, as with the previous model, the major difference is the price. Urban Rebounders retail at a significantly lower price point, making them a more budget-friendly option. However, the Cellerciser reviews make it clear that this is a durable and high-quality rebounder, while many users report the Urban Rebounder models being more flimsy. While the Urban Rebounder has a spring system, the Bellicon uses high-quality bungees. Again, you will need to decide which is best for your own personal needs, and whether you want a rebounder that is silent. If you're looking for a stability bar, Bellicon does not include one with all of their models like Urban Rebounder, so you will need to check your particular model comes with one. Again, a key difference between the two models is the price. However, Bellicon has a better track record as being a long-lasting and high-quality product. The Urban Rebounder can support a maximum weight of 300 lbs. This is quite high in comparison to the whole of the market. There are various different ways to exercise on a rebounder. 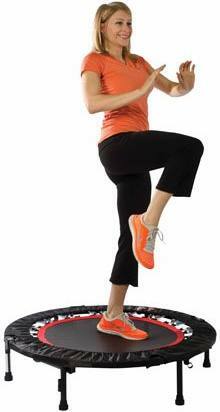 As the Urban Rebounder is portable, it is possible to take it with you to a specialist class. However, the fitness DVD has 6 guided workouts, which should help to get you started with rebounder exercises in your own home. Hopefully our Urban Rebounder trampoline review has helped you decide if this is the right rebounder for you. The low price point makes it a viable option for those who find that other brands are simply not affordable. However, please carefully consider some of the concerns we have raised before choosing to invest. Happy bouncing!